The green scale, Coccus viridis (Green), an insect pest of citrus and other plants, is found out-of-doors and in greenhouses in Florida. This pest was first found in Florida near Davie, Broward County in May 1942, by State Plant Board grove inspectors, and is now well established in south Florida. This insect is also referred to as the coffee green scale. Occurs in the tropical regions of the world (Merrill 1953). Thought to be of Brazilian origin the green scale is presently cosmopolitan in distribution throughout the Tropics except for Australia. As of 1976, it was reported in 27 Florida counties, but is more commonly found in southern Florida. Adults: The adult female is shiny pale green with a conspicuous black, irregular U-shaped internal marking that is dorsally visible to the naked eye. Two sub-marginal black eye spots are also present and can be seen with a hand lens. The outline shape may be described as elongate-oval and moderately convex. Adult scales are 2.5 to 3.25 mm. Dead scales are light brown or buff color and the black internal marking is lost. Figure 1. Adult female green scale, Coccus viridis (Green). Photograph by University of Florida. Nymphs: Nymphs, or immature green scales are oval, flat and yellowish green in color, and have six short legs. There are three nymphal stages before becoming an adult, each stage being larger and more convex than the previous stage (Mau and Kessing 2006). Eggs: Eggs are whitish green and elongate-oval and are laid singly and hatch beneath the female where they are protected. Eggs hatch from a few minutes to several hours after being laid (Fredrick 1943). Green scale is parthenogenetic and oviparous (Fredrick 1943). Some adults were observed by Fredrick to complete egg deposition in eight days, and others deposited eggs over a 42-day period. In south Florida, the length of time that passed from the egg to egg-depositing maturity during the late summer months was from 50 to 70 days (Fredrick 1943). Eggs hatch into crawlers that wander around the plant or disperse to other hosts. Once a suitable leaf or green shoot is found the nymphs settle and begin to feed. They usually remain in this same spot unless their position becomes unfavorable. The mature female does not move (Mau and Kessing 2006). Green scale appears in a rather definite pattern on citrus leaves. The undersurface of the leaf is preferred, and adult scales may be found in a line along both sides of the midrib and lateral leaf veins. Often they attack the young shoots, then one can usually see only a mass of scales (Martorell 1945). Figure 2. 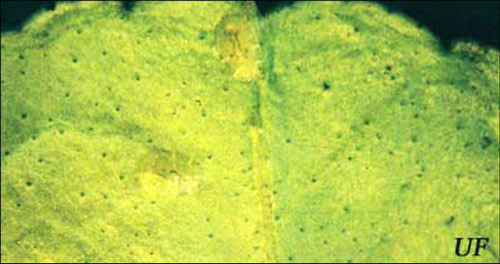 Infestation of green scale, Coccus viridis (Green), showing the typical arrangement in a line along the mid-rib and lateral views. Photograph by USDA. Figure 3. Green scale, Coccus viridis (Green), on grapefruit leaf. Photograph by University of Florida. The green scale has a wide host range consisting of vegetable, fruit and ornamental crops (Mau and Kessing 2006). The preferred host for green scale in Florida is groundsel bush, Baccharis halimifolia L., a non-cultivated plant. Preferred cultivated hosts are gardenia and ixora. The Division of Plant Industry has recorded green scale on 174 hosts in Florida since 1942. Figure 4. Green scale, Coccus viridis (Green), on green citrus fruit. Photograph by University of Florida. 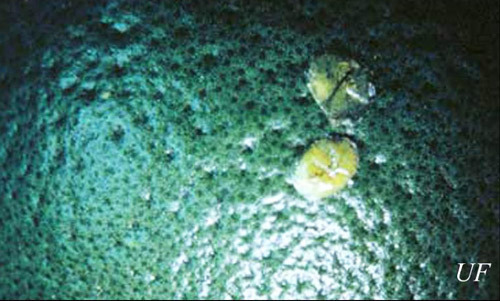 This tropical soft scale may occur on cultivated hosts in commercial nurseries, resulting in a quarantine of the infested plants until the scale is under control. Usually infestations are accompanied by sooty mold, a black fungus growth, which develops on honeydew excreted by the scale. Accumulations of sooty mold cause the infested plant to be unsightly. When large populations are present yellowing, defoliation, reduction in fruit set and loss in plant vigor are caused. This pest is especially damaging to young trees in the first two years after transplanting (Mau and Kessing 2006). Chemical control: Direct insecticidal sprays to lower leaf surfaces and new growth to give thorough coverage. 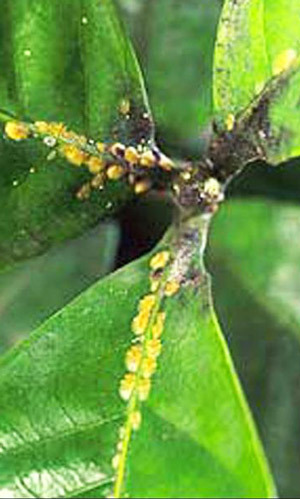 Biological control: Several entomogenous fungi were observed associated with green scale on citrus, and some apparently played an important role in the natural limitations of the scale on citrus during certain seasons of the year. In Florida, these fungi include: the white-fringed fungus, Verticilium (Cephalosporium ) lecanii (Zimmerman); Aschersonia cubensis (Cuban aschersonia); the pink scale fungus, Nectria diploa; and a grayish blue fungus The white-fringed fungus is the most common and apparently causes the highest percentage of mortality. All attempts to artificially spread or inoculate the fungus to healthy green scale were unsuccessful (Fredrick 1943). The green scale is often associated with ants. Controlling ant populations help to reduce levels of this pest. Ants protect the green scales from lady beetles and other predators. In turn, the ants feed on the sweet honeydew excreted by the scales. Without the ants the green scale is more vulnerable to predation by beetles (Mau and Kessing 2006). Cultural Control: Scales are usually brought into greenhouse situations with the introduction of infested plant material. All plant material going into the greenhouse should be thoroughly inspected for scales and other insects before being introduced (Copland and Ibrahim1985). Copland MJW, Ibrahim AG. 1985. 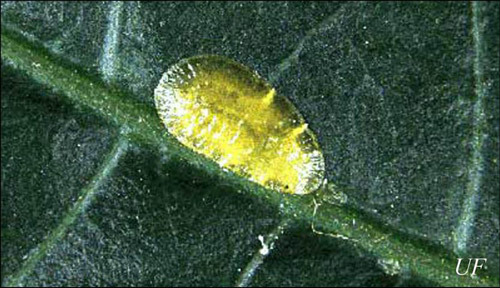 Chapter 2.10 Biology of glasshouse scale insects and their parasitoids. pp. 87-90. In Biological Pest Control: The Glasshouse Experience. Hussey NW, Scopes N. (editors). Cornell University Press. Ithaca, New York. Fredrick JM. 1943. Some preliminary investigations of the green scale, Coccus viridis (Green), in south Florida. Florida Entomologist 26: 12-15; 25-29. Martorell LF. 1945. A survey of the forest insects of Puerto Rico. Part II. Agr. University of Puerto Rico 29: 399-400. Mau RF, Kessing JL. (July 2006). Coccus viridis (Green). Crop Knowledge Master. University of Hawaii. http://www.extento.hawaii.edu/kbase/crop/Type/c_viridi.htm (28 September 2018). Merrill GB. 1953. Scale insects of Florida. State Plant Board of Florida Bulletin 1: 93-94. Authors: G.W. Dekle (retired) , Florida Department of Agriculture and Consumer Services, Division of Plant Industry, and T.R. Fasulo (retired), University of Florida. Originally published as DPI Entomology Circular 165. Updated for this publication. Publication Date: December 2001. Latest revision: September 2018.